The EAIA meetup last weekend was held at the recently renovated Dills Tavern, originally built in 1794. The weathermen promised a warm, sunny day, but it was cloudy and frigid, which prevented me from staying for all the day's activities. 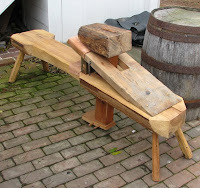 I was sorry to have missed Jim Leamy's afternoon lecture on making plow planes. The ivory plow plane was one of many of his exqui site planes that were on display. Tailgating with vendors who were selling antique tools started early, and was followed by presentations by the man in charge of restoration —Sam McKinney—and a decendant of the family who purchased the tavern in 1800—Bob Eichelberger. The three years it's taken to bring the tavern back to its original form included removal of many Victorian elements and additions that were added in the late 19th century. 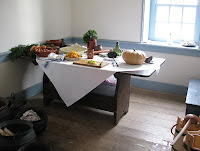 The kitchen needed to be gutted and other rooms needed major work, but as much as possible of the original architecture and flooring was salvaged. That which could not be saved was either replaced with elements that were purchased from other period buildings or were authentically reproduced by the men who conducted the renovations. 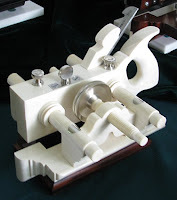 On display were a plethora of antique moulding planes that they employed during construction. "We basically removed anything that used common nails" explained Sam, who in my opinion is part detective—because of his ability to uncover the clues that enabled him to restore the historic building to its original state—and part visionary. The tavern, outbuildings, and grounds are being fashioned in the same pattern as Eastfield Village, where Sam has taken classes since 1983. 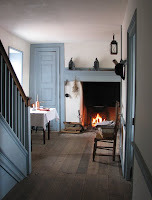 His vision is to replicate the original Dills Tavern setting, including distillery (ironic, since Dillsburg is currently a dry town), and to offer workshops that teach 18th c. techniques in stonework, timber framing, basket making, wool dyeing, and open hearth cooking. They have recently started construction of an 18th c. timber frame woodwright's shop, in which the 3 men who have so diligently reconstructed the tavern will build authentic reproduction furniture, including my favorite, PA German. Their pieces will furnish the tavern and will also be for sale. I will try my best to practice restraint and not make him regret having told me that....lest I be labeled the Dills Tavern Stalker.